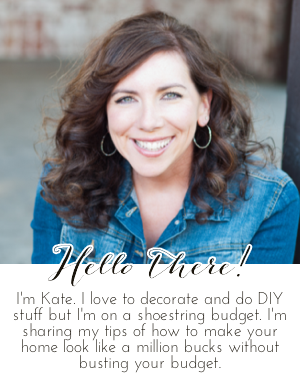 Chic on a Shoestring Decorating: Guest Post: Home Staging Tips from Leslie at Goodbye House, Hello Home! 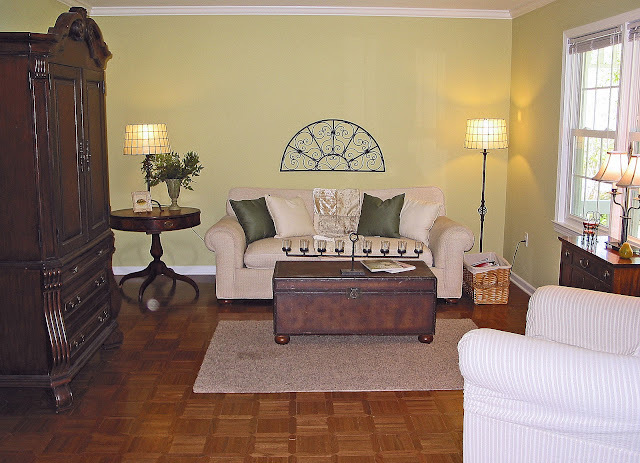 Guest Post: Home Staging Tips from Leslie at Goodbye House, Hello Home! Leslie was kind enough to talk to me (a complete stranger at the time) about starting my own interior decorating business. She is a very talented and I think you'll find her post today about home-staging to be very informative as we head into house selling season. preparing a home to be SOLD. I hope I am clear about the differences. Home Staging is different from Interior Design. and functional for the occupants in the home. The goal of Home Staging is to feature the home/house/property, not the occupants. to be so enamored and curious about your life, that they forget why they came in the house. Potential buyers need solely concentrate on imagining themselves in the home for sale. the home will seem larger and presents the home in its' best possible light. bidding war, and it sold in one weekend) was cozy and warm and even tidy. 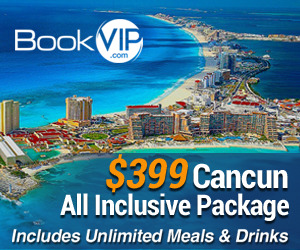 prevent the buyers from walking around and imagining their life here. and a screen, the room opens up and invites buyers to enter and sit and dream. to the perception of relaxation or the promise of conversation. The sofa is now facing the foyer to bid the visitors a warm welcome. 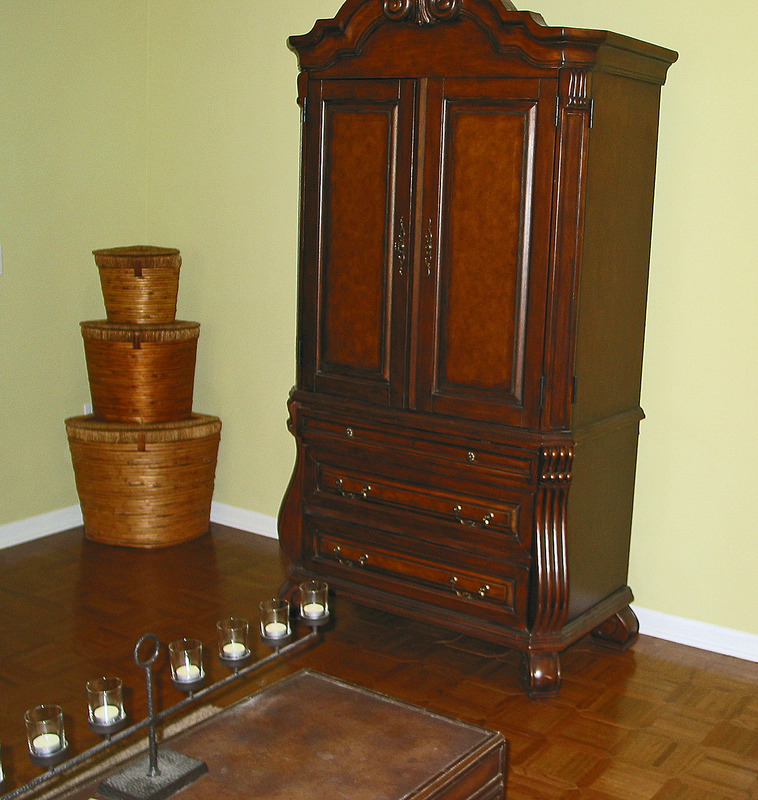 The armoire is opposite the window for balance and scale. "Come in. Sit down. Relax." and personal items like books (with titles that left clues to the homeowners' preferences). Window treatments were removed and the blinds raised to let in light or allow perspective buyer to peek in the windows (so they want to call the Realtor to let them come inside and see the rest of the house). Simple stacked baskets wait patiently in the corner, not more seating. Notice there is only one piece of "art" in this room, the scrolly iron demilune piece. A room need not have something on every wall: seating or art. Simple is best so the eye can rest. The goal is to balance the room. Place the furniture first, then the lighting, accessories, and art. 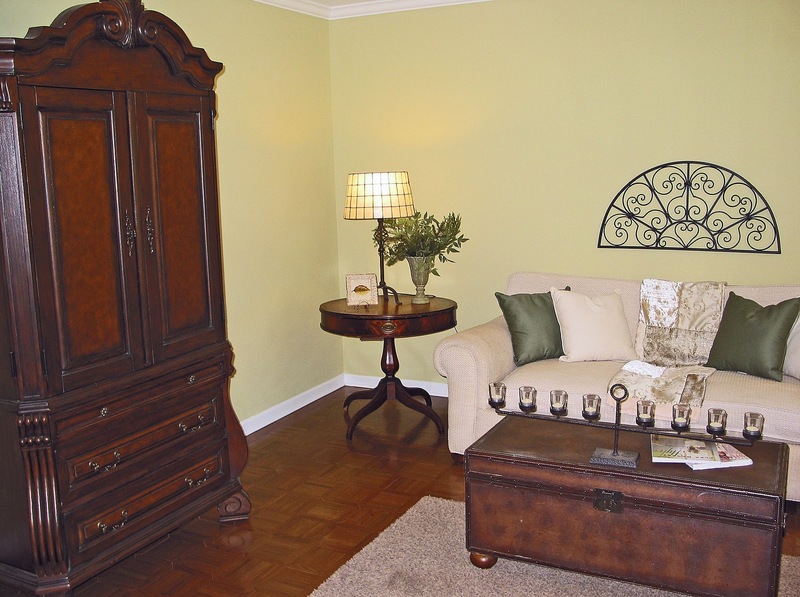 Have a good distribution of the larger pieces (here: the sofa, chair and armoire) throughout the room. The heights of furniture should more up and down gradually with no cliff-like drop-offs between items. Remain detached emotionally from your house. See your house through buyers' eyes. It is no longer your home. It is a building, a commodity that you want to sell for the highest amount possible! Remove extra furniture, personal items (pictures/books/art), unhealthy or excess plants, heavy window treatments (or at least pull them to the sides of the windows), from the room. Clean windows inside and out. (As a stager, I typically have the homeowner remove the screens from the front windows of the house- it make the windows sparkle and shine and it's more appealing than the dullness of gray screening). Dark paint or busy wallpapering like in my foyer, must go. Store all video tapes, CDs, gaming equipment, small TVs, small stereos, photo albums TV guides and remotes. Paint molding, or fireplace mantel, if needed, to match rest of molding and doors in the house- white is best for unifying. Clean carpeting or polish floors. If carpeting needs to be replaced, do it. If wood flooring needs to be refinished, do it. Hide, as best you can, all cords and outlets in the room. All toys should be kept in a container, out of sight. Keep entertainment center doors closed. Consider covering the inside of glass doors with fabric to hide distracting and unsightly equipment. Clean the fireplace and put fresh logs inside it. Three lamps, minimum, help light the room. Realtors will turn these on before showings, typically to welcome buyers. Overhead lighting kills coziness. Keep TV and electronics off during showings. Have you any thoughts or questions for me? These are great tips and I can attest that they work- I did a lot of this stuff when we sold our last house, and despite the fact that every other home for sale in our neighborhood had sat for close to a year, ours sold in a little over a month. That's great in this market!! I'm heading over to Kate's site now to check out some of her other posts! Very helpful. Nice job! It is really important to put your house in it's best light with this market. Come see my first give-away. Great tips! What about when you've already moved and the house is empty? Is there anything to do to make the home more inviting when it's completely empty? Everything is clean, but there's nothing there to make it feel cozy. We live in another state and our house has been on the market almost 7 months. Very discouraging, not to mention financially draining!!! I love being at your place! I am really enjoying reading your blog! wow just look at all that gorgeous furniture! These tips will really make your house inviting and cozy! I remember selling our house and our real estate agent asked us to buy some things to make the buyers feel at home and so we did. In no time, our house was sold and we are now living in our new home. You should try hiring a professional too! It’s less of a hassle and very convenient.